Less than a week to go before we head off on our cycling adventure, and we’re both very excited about the trip. Since we met some of our fellow cyclists in London in November, time has felt like its accelerated and soon our journey will begin. We’ve managed to fit in a few more cycling miles, although not as many as I’d have liked. When the wind has been at a tolerable level, rather than threatening to blow us sideways, we’ve been out cycling at the weekends. Cycling in Tyne and Wear and Northumberland in January involves a lot of dressing up. First you have to wiggle into your thermal bib tights; then add a base layer or two. I have a lovely cosy cycling jersey, so that goes on next, followed by a jacket. And then full finger gloves, designed to keep off the worst of the wind and rain, but still leave hands free to work the brakes. The warmest socks I own, often topped with a second layer before I shuffle into my bike shoes, which are then sealed in by neoprene overshoes, in a bid to keep out the worst of the water. I already appreciated the value of a buff, either wrapped around my neck, or shrugged up around my ears on cold days out running. But the thermal version has been very handy on the bike too, covering both neck and ears beneath my cycle helmet. Last weekend, we headed out to Northumberland. 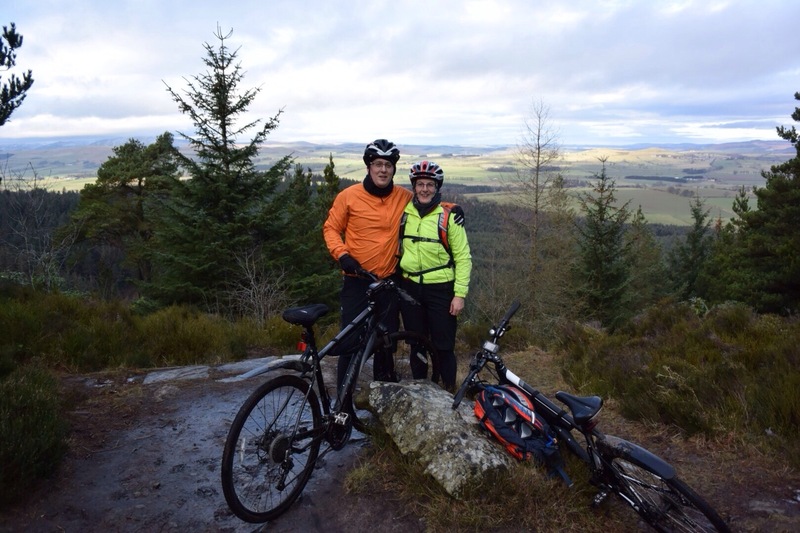 Thrunton Woods is a popular walking and mountain biking spot and the trails there proved an uphill and technical challenge, rewarded by a stunning view at the top. The gravel paths, covered in parts with ice, and a steep downhill stretch tested my nerves to the limit. Gary fared better with his superior bike-handling confidence. I was pleased to get to the bottom with no slips or falls. Next week, we’ll be swapping thermals for lightweight T-shirts and shorts for cycling in Vietnam, where temperatures will be nearer 30C rather than -3. And we’ll no doubt be looking forward to ice cold drinks, rather than post-ride hot chocolate. Whatever our adventure brings, I’m really looking forward to seeing a new part of the world, testing myself against the challenge of cycling 460km and enjoy all the new experience this trip promises. I mentioned in our introductory post that I used to ride a lot when I was younger (and fitter) but it’s been about 20 years since I last plonked myself on a saddle. So getting back on a bike has taken a bit of getting used to. Muscles that used to power my pedals have since withered away, and despite padding appearing around my waist it sadly doesn’t seem to be where I now need it most. We started training shortly after signing up for the challenge back in July, taking advantage of the long days to get out for an hour or so after work in the evenings, or at the weekend. I’ve really enjoyed discovering parts of my local area that I hadn’t previously explored – inaccessible by car but perfect for cycling. The North East of England is known for its coal-mining heritage, and a legacy of that in our area is the Waggonways. This 19th century wooden railway network was used by horse-drawn waggons to haul coal from the many collieries in the area down to the banks of the River Tyne, for onward transport to other parts of the country by ship. In recent years these old routes have been revitalised and now form a network of cycle-friendly paths populated by walkers, runners, as well as cyclists. The close proximity of the Waggonways has meant that most of our training rides have involved at least some part of the network. In September, however, we had a week off work and visited family up in Dumfries and Galloway. This gave us an opportunity to try some new routes and 7stanes was recommended to us, so we headed off to Ae. We did have some concerns about whether we and our bikes would be up to the demands of proper mountain bike trails, but we stuck to the green (easy) and blue (moderate) routes and survived intact (albeit with a hairy descent at one point). During September and October we were also able to combine our cycle training with foraging from the hedgerows that lined so many of our routes. We managed a healthy harvest of blackberries and rose hips that were transformed into jams, cordials, and syrups to be enjoyed after subsequent training sessions. Up to this point all of our rides had been relatively short, up to a couple of hours or 30km a day. 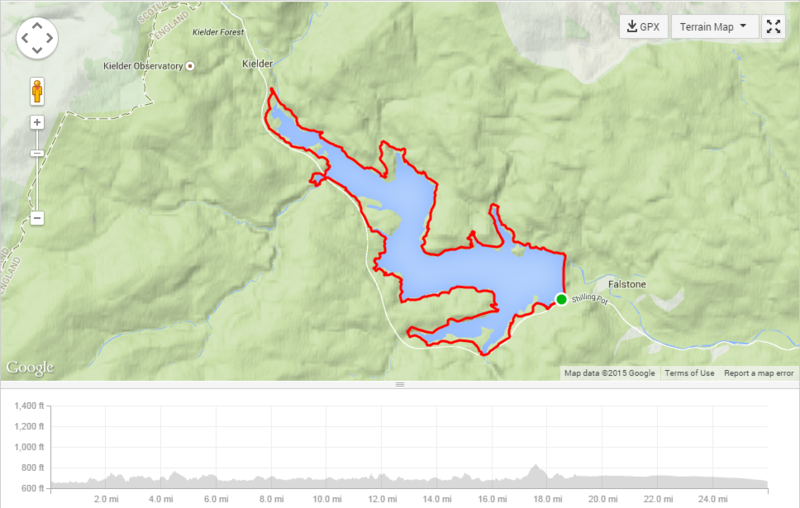 So in late October, realising the need to get some longer training runs in, we decided to head up to Kielder Water and tackle the 26 mile trail that follows the shoreline of the reservoir. Unfortunately on the day we chose it was blowing a hoolie and the rain was hitting us as hard as hailstones, but we persevered, reminding ourselves that it’s very unlikely we’ll encounter similar conditions in Vietnam and Cambodia! Finding time to train has become increasingly difficult as the nights have drawn in and the crazy month of December arrived upon us. We have a turbo trainer that allows us to do some training indoors, but I find it very uninspiring and akin to being a hamster on a wheel. So once the madness of Christmas was out of the way we headed back outdoors to sample the icy delights of the Waggonways as well as part of the Reivers Route. Most recently we took part in a local social Sky Ride which covered some of the Waggonways we already knew well, but also introduced us to some new paths that we intend to incorporate in the final month of training ahead. Most importantly though, this gave me the opportunity to experience cycling as part of a larger group which is quite different to cycling alone or even in a small group of 2 or 3 people. They say there’s strength in numbers and I certainly seemed to find a whole new level of strength, stamina, and confidence, which was a great comfort. Especially having looked at my training logs and realising the total distance I’ve covered in the last 6 months is the same as I’ll be covering in 7 days of cycling in February… Gulp. As this is our first post it makes sense to explain what this is all about. In short, we’re taking part in a cycle ride through Vietnam and Cambodia in February 2015 in aid of CARE International UK. I first came across this charity when I stumbled upon their Lendwithcare website last year. It struck me as a really innovative way of giving to charity, firstly because you loan rather than give which means the same amount of money can do so much more in the longer term, but secondly because you get much a better understanding of your money will enable than can ever be possible by simply dropping coins in a bucket. The step up from being a Lendwithcare lender to doing a cycle ride across two countries was one of those things that came out of the blue. We’d been thinking about places to go on holiday next year but couldn’t really decide on a destination. We’re very fortunate to have already travelled to some amazing places and like to get off the beaten track a bit if we can. I think that’s one of the best ways to get to know a country, and it’s enabled us to meet some wonderful people along the way. In recent years Michelle has become a keen runner, swimmer, and cyclist, and regularly takes part in middle-distance runs as well as triathlons. In fact it can be difficult to find a suitable slot for a holiday during the summer in between the various events, which is why we’d decided to think about next year uncharacteristically early. Whilst Michelle has fully embraced an active lifestyle, I’ve admired her dedication from the comfort of the sofa. I was a keen cyclist in my youth, but once I had a driving license my preferred mode of transport became four wheels rather than two. In late June a Lendwithcare newsletter arrived in my inbox that mentioned the Vietnam to Cambodia cycle ride and it was a light bulb moment. An opportunity to visit an part of the world we haven’t been to, meet some interesting people, travel under our own steam, and hopefully do some good for a great cause at the same time. A winner all round. In order to take part in an event like this the charity naturally expects you to raise a target amount in sponsorship both to cover the costs of the event as well generating funds. Reflecting on our personal circumstances we chose to self-fund our participation by using our savings rather than ask family, friends, or generous strangers to contribute to what we expect will be an amazing experience for us. Choosing this path also allows us to focus on raising awareness of Lendwithcare rather than simply asking for money. We do of course have a Just Giving page if anyone does just want to donate to the charity, but what we’d really love is people to consider become lenders themselves. We’ll be updating this site both in advance of, as well as during the trip (time and technology permitting), and sharing our experiences with you. It’s the first time we’ve done anything like this so we don’t really know what to expect. In the meantime, you can find out a bit about where we’re going via our itinerary.